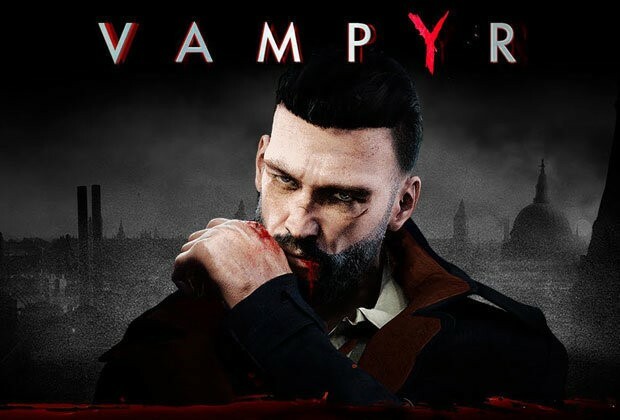 Vampyr is an upcoming game from Dontnod Entertainment, known for their work on the unique Life Is Strange. This looks set to be a dark, immersive experience with a macabre atmosphere. You will step into the well-heeled shoes of one Jonathan Reid, a doctor who finds himself transformed into a blood-sucker after being attacked by a mysterious stranger. He’s seen plenty of death and gore in his time, having worked as a military doctor during the war – but nothing can prepare him for his new life. The game takes place in London in 1918, following the Great War’s conclusion. Civilians are suffering from the Spanish Flu, and its only growing more prevalent. Vampires and other occult elements lurking in the shadows are vying to rule the night as the government tries to pull the capital city into something resembling its former state. It’s the perfect climate for a takeover by supernatural monsters – unless Dr. Jonathan stops them. While becoming a vamp might be the cue to start biting necks and unleashing endless amounts of gore in many a game, Dontnod are determined to make Vampyr more of a morality-based title. How so? Jonathan will find himself struggling between his increasing craving for blood and his oath as a doctor, seeking a cure for his condition whilst needing nourishment to survive. 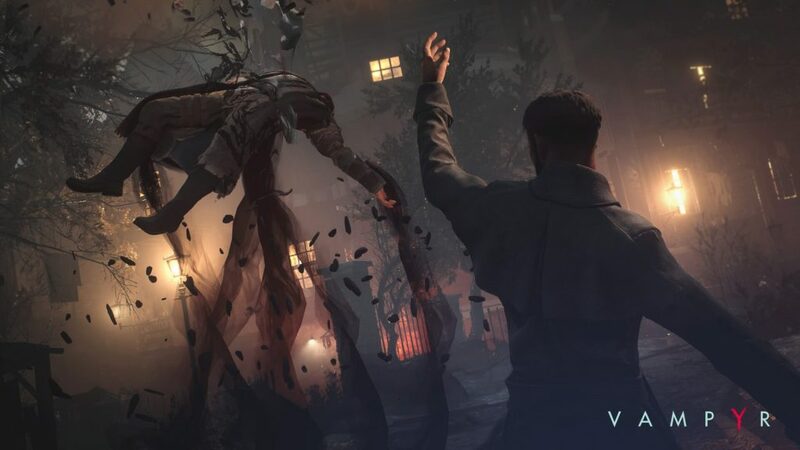 This conflict drives one of Vampyr’s most fascinating elements: you can actually get through the game without killing anyone at all. This might sound like a challenge, and it no doubt will be, particularly as choosing to forego murder will make it far harder to gain experience and level up. Still, one of the game’s multiple endings is reserved solely for any player who can get through the adventure without blemishing Jonathan’s role as a doctor and letting no innocents die from a touch of his fangs. Fancy turning the good doctor into a killer instead? You can, and it’s a deep, involved process. You will need to learn more about your targets before you decide who to feed on, exploring their everyday routine and habits. All of the NPCs are designed to have some kind of effect on the game’s open-world version of London, and killing them will make an impact on others around them. The environment and community in which Jonathan lives / hunts will no doubt feel more realistic as a result of this cause-and-effect structure, and you’ll have to think carefully before you feast on someone. Killing is unlikely to be quite as simple as just grabbing anyone at random, though this may be a possibility depending on the moral approach you want to take. There are benefits and risks of feeding on civilians, though. The more people you kill, the more abilities you’ll have access to – but you’ll face a bigger challenge too. You can transform others into vampires if you like, and you use your special ‘mesmerise’ power to glean key information from your victims. You can even use medicine you have crafted yourself to improve the health of specific ailing targets, preventing Jonathan from drinking tainted blood. Your experience points will actually be better if you can do this, and you’ll be able to judge victims’ health courtesy of Jonathan’s shiny new vamp-senses. As you level up, you will be able to improve Jonathan’s abilities on the skill tree, equipping you with more strength and power when facing enemies. The skill tree will give you a choice between a more confrontational offensive style and a defensive approach. Combat will allow Jonathan to unleash his vampiric strength and rage: an on-screen blood gauge will fill as you brawl and deal damage, and Jonathan will be capable of especially tough moves when it’s full. Devouring blood from an enemy without having to get close will be just one benefit of embracing your dark side, though there will be others too. 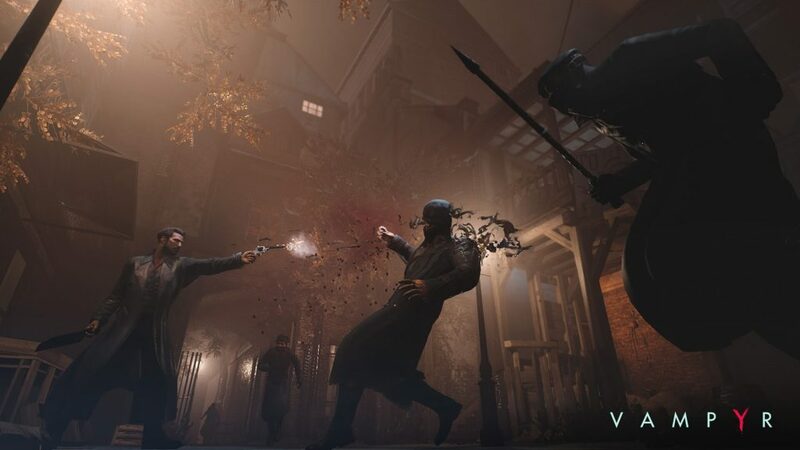 There are different types of vampires to fight during Vampyr, including the Ekon, a more upmarket, aristocratic kind of blood-sucker. There are also Skals (which live in the sewers of London), Vulkod (tough cookies who pose more of a physical danger), and Nemrod (self-loathing vampires who want to wipe out all of their own kind). The Guard of Priwen will be another group Jonathan has to cope with, a secret society of vampire-hunters who want to rid London of the neck-chomping fiends. Vampyr’s London isn’t an exact recreation of the entire city, but instead is made up of four distinct districts. Witechapel, the hospital in which Jonathan works, the East End Docks, and the famous West End will all feature, each with its own feel. Jonathan can build his own weapons to protect himself on the streets, using resources taken from his victims, while you’ll get to draw on his more supernatural abilities too. Lurking in darkness and jumping out on enemies is possible courtesy of Jonathan’s shadow-controlling talent, while he can move with enhanced speed and become invincible for a time too. We’ve all played as a souped-up vampire at one time or another, but Vampyr’s more realistic take on the mythology should be fascinating. 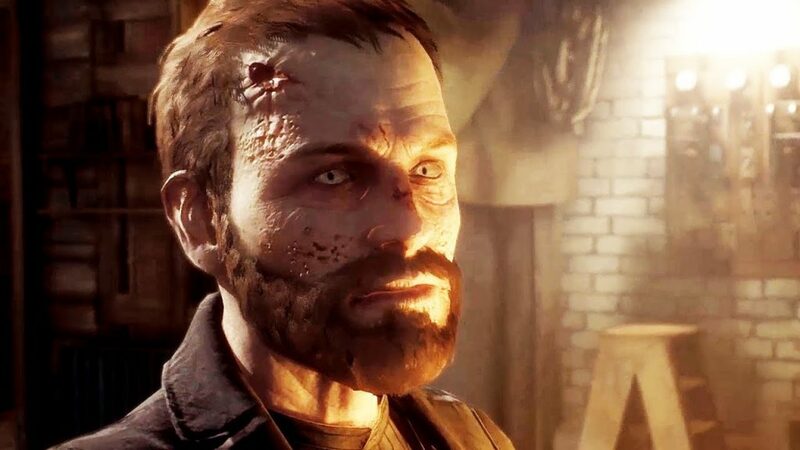 The Dontnod Entertainment team have invested time and resources into researching London at the time in which Vampyr is set, as well as educating themselves on medical details to add extra authenticity to the game. Motion capture has been used to give characters more realistic movement too. Vampyr is set for release on the PS4, Xbox One, and PC on June 5th. It looks like it could be one of the best, most immersive vampire video games ever made, with real depth and consequential player choices. It was a smart move making the lead character a doctor immersed in a world of science and rationality, as his gradual descent into vampirism should be more compelling. Let’s just hope Vampyr is as good as it can be when it’s released later this year! Dontnod Entertainment’s Vampyr is shaping up to be an original, exciting, immersive vampire game with real depth. What do you think of the footage released so far, and what kind of vampire do you think you’ll be in the game?